For your attention: this text describes what is, in my opinion, the best way to clear this dungeon. 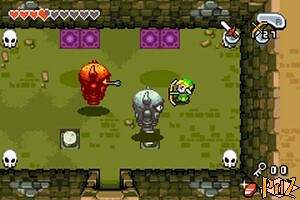 But the order in which you find the keys and open the doors doesn't matter, there is a way to clear the dungeon. Go left, get in the room and shatter the skulls if you need to refill your hearts. Climb the stairs, then go up and shoot an arrow at the eye on the wall. Go left, get rid of the four Stalfos and go on down. Go right, be careful of the red ruby which hides a Like Like and climb the ladder. Go left and top. Climb on the platform to the left, then get on the next one and finally the third one. Shoot an arrow at the eyes to the right and left of the door, then go right. Get rid of the snakes, shatter the skulls, then stand on one of the slabs at the top. Use the power of cloning to create a clone right under you, then push the block as far as you can. Do the same, and this time, push the block at the bottom towards left. Create another clone, but now, he must be on your right or your left. Then, go right and push the first block to the top. Pull the lever to make a Small Key fall, then go back left. Climb on the middle platform, then shoot arrows at the eyes to the left and right of the door. Go forward, stand on the slab under a switch, create a clone on the slab over the other switch, then walk on those switches. Get rid of the two statues with three arrows each, then pick up the Compass from the chest. Go back to the ground floor (you can fall into a hole to save time), pick up the Small Key and leave to the entrance corridor. Get past the next room and get in the following one (the second from the right). Climb the stairs, shatter the skulls on the right, pull the lever and open the chest to find a Kinstone. Shatter more skulls, find another Kinstone, then pull the lever and get out from the bottom. Climb the ladder and go to the next room. Go left, wake up and get rid of the statue on the right. Stand on the slab where the statue was and use your power of cloning to create a clone on the slab on the far right. Go back to the right with the clone and walk on the switch on the right so you open the door together. Go ahead, shrink on the pedestal, then come back down and on the left. Get in the statue, switch it on, then go back to your size to the left. Push the block, get rid of the statue (be careful not to fall! ), then pull the lever to make a Small Key fall. 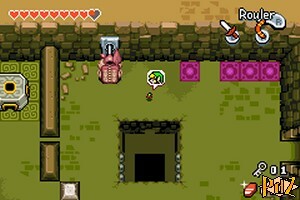 Shrink to a Minish size again, jump into the hole and follow the passage on the right. Go back to your size, pick up the Piece of Heart, then push one of the left blocks to the bottom and get out. Go back in the room to the left, pick up the Small Key and get out. Get in the room to the left (facing the entrance) and climb the stairs. 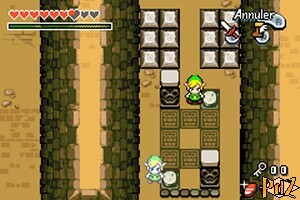 Get rid of the Stalfos, then shoot an arrow at one of the two statues at the top, draw it to you and get past it. Climb the stairs and pick up the Map in the chest, then open the door on the left. Climb on the platform to go across while going around the blocks, then go left. Be careful of the Wallmaster that will fall from the ceiling, get rid of it if you want to, then shoot an arrow at each eye in the wall and cross the bridge. Get to the next door to fight another Darknut. Fight this one like the one in the Wilds, then go on down. While avoiding the traps, walk on the switch and go down. Go right, drop a bomb next to the wall in front of the middle drawing on the ground and go ahead. Open the chest to find the Mole Mitts! 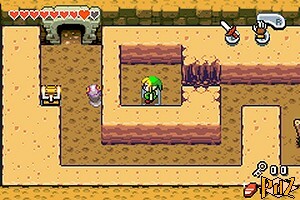 Use this new gear to dig the sand and find 100 rupees in the small chest. Go back down, then right. Now open the door on the right. Pull the lever, then as soon as the bridge appears, use the Pegasus Boots to cross the right part of the bridge. Go right and get rid of the three Wallmasters to make a pedestal appear. Go on right, go down, then go right while avoiding the rolls thanks to the holes. Pull/push one of the statues on the switch to the bottom right and move the other statue on the switch to the top left. Get rid of the snakes at the top, stand on the bottom left slab and create a clone on the top right one. Then lead your clone to the bottom and stand on the two other switches. Pick up the Small Key and open the door to the bottom, but come back straight away to the top left. Shrink on the pedestal, then go back right, cross the small passage, go down, slide between the two rolls and get out through the previously opened door. Go left and get through the passage to the top. Go back to your size and walk on the switch to make a Small Key fall. Use the Mole Mitts to dig the sand and pick up the Small Key, then shrink again and get out. Jump, go back to your normal size, then go right and down. Use the Mole Mitts to reach the ladder at the bottom, climb, go up and open the door. 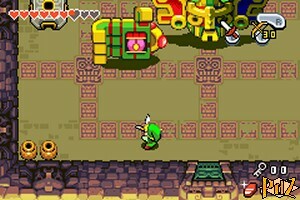 Jump into the hole to the right, then open the chest to find the Big Key. Push the block, jump and go left twice. Jump, climb the stairs and jump down. Every action described in this paragraph is optional. If you want to face the boss straight ahead, go to the next paragraph. Go down the stairs, get out in the corridor and use the Mole Mitts to dig on the left and unveil another door. To the far left you will find a chest containing a Kinstone. Get in the new room, get rid of the two enemies with the sword, gather 80 mysterious shells from the chest and get out. Get in the room on the right, go up, left, down and dig to find a chest withholding another Kinstone on the right. Climb the ladder, use the Mole Mitts to dig on the left, walk on the switch and you will find a Kinstone in the chest. Go back to the entrance corridor. Get in the second-to-last room on the right, climb the stairs, go down, use the Mole Mitts to reach the chest and find a Kinstone. Climb the ladder, dig on the left to get a Kinstone and go back in the corridor. Get in the room facing the entrance and climb the stairs. Go down. Use the Mole Mitts to unveil the statue, pull it on the switch and get a Kinstone from the chest. Climb the ladder, go up and push the block against the wall to make a warp tile appear. Open the boss door at the top, shatter the skulls to refill your ammos and go up. To beat this boss (which looks like Gohdan from "The Wind Waker"), use the bow to shoot an arrow at one of its hands, then hit several times this hand with your sword until it smokes. Next shoot an arrow at its other hand and hit it several times as well, doing so quite fast so they're both still. At this moment, its head will fall. Get quickly on one of the pedestals, shrink, then get inside its head. Quickly swing your sword at the shining statue and you will end up outside. Again, shoot an arrow at each of his hands, then shrink and get back inside its head. 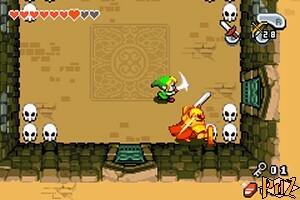 Quickly dig the sand to find a shining statue and hit it with your sword several times. For the last time, shoot arrows at its hands, get inside its head and dig to find the last statue. It will be defeated for good! Pick up the Heart Container, then go up, go ahead and take a look at the stele. The Wind Tribe people took the Wind Element with them and left behind the Ocarina of Wind for you!